Clients of American Patriot Getaways rent our Pigeon Forge cabins mostly to get away from the ordinary and Pigeon Forge does not disappoint! It is a wonderful, with amazing people, great attractions and delicious food. Below you will find some information about the city we love so much. If you have any questions about cabins in Pigeon Forge please don’t hesitate to call us at . Many, many years before Tennessee was a state, Pigeon Forge was a Cherokee Indian hunting ground located in what had come to be known as the "Lost State of Franklin." It was after the Revolutionary War that the State of Franklin and the Cherokee Indians agreed to peace with the signing of the Treaty at Dumplin’ Creek. Pigeon Forge was once part of North Carolina. Settlers first reached the area in 1788, when the area was governed by North Carolina. Pigeon Forge was the site of an iron forge built in 1820 by Isaac Love. His son built the Historic Old Mill in 1830. The other half of Pigeon Forge's namesake is the passenger pigeon. Although passenger pigeons are now extinct, the community of Pigeon Forge preserves the memory of bygone era that brings to mind the rich diversity of life in the wilderness frontier that was East Tennessee. By 1907, the town's population had grown to just 154 residents. But, by the 1930s, the beauty of the Great Smoky Mountains had begun to lure visitors to the area. In 1934, when Great Smoky Mountains National Park was established, the first guest cottages were built along the river. Pigeon Forge's reputation as a friendly resort town steadily grew from there. Today, more than 11 million guests visit this flourishing Smoky Mountain city each year. Voted one of the South's favorite shopping spots by Southern Living readers, Pigeon Forge is equally famous for its more than 200 factory outlets and specialty stores. 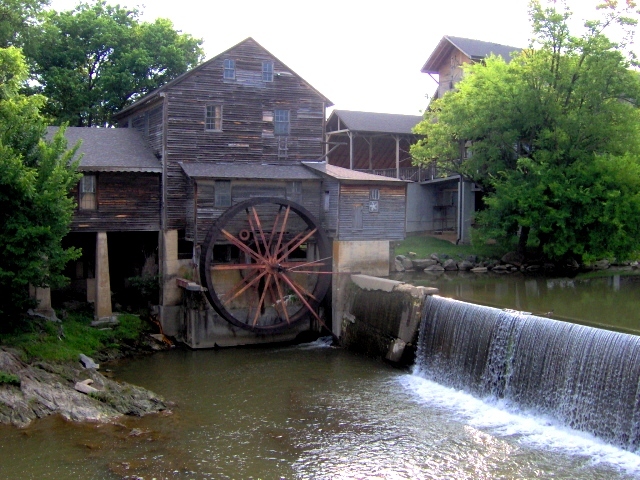 The Old Mill is a nationally recognized Historical Site and is located on the West Prong of the Little Pigeon River in the heart of Pigeon Forge. In the old days, it was the heart of the community and served as a gathering spot for villagers. During the Civil War, looms were set up on the second floor to make woven articles for soldiers. The area around the Old Mill was first settled by pioneers near a river in the early 1800s. The river was named Little Pigeon because of its popularity with pigeons, and the name was given to the community as well. William Love dammed up the Little Pigeon River and began construction of the first building of the Old Mill. He utilized 40-foot-long, 14"-by-14" Yellow Poplar logs, which are clearly visible even today. Huge river rocks serve as pillars to support the structure. This is one of the most photographed structures in Tennessee. The mill has been in continuous daily operation since its completion in 1830. Casual attire is what it is all about and that's a big part of being on vacation in Pigeon Forge, Gatlinburg and the Great Smoky Mountains. It's pretty much the standard around here. We have a couple of restaurants where you might feel like sprucing up a little, but it's really up to you. In spring and fall, days start off cool, warm up and then cool off again. Winter temperatures generally stay in the 30-50 degree range so heavier clothing is appropriate. No matter what time of year, if you're planning on a visit to the mountains, bring along a wrap. Higher elevations may get even prettier but it means cooler temperatures, too. Pigeon Forge is located in the eastern portion of the beautiful state of Tennessee in an area known for its traditional Appalachian crafts, music and folklore. The overwhelming beauty of the Great Smoky Mountains is visible everywhere you look. Two-thirds of the nation's population lives within a day's driving distance. Interstates I-40, I-75 and I-81 are all nearby. Pigeon Forge is 35 miles southeast of Knoxville, 5 miles north of Gatlinburg and 5 miles north of Great Smoky Mountains National Park. Countless accommodations are offered in the Pigeon Forge area, American Patriot Getaways offers some of the best, most luxurious and affordable cabins, chalets and condos with easy access to an abundance of fun. Centered between Sevierville, Gatlinburg and the National Park, your vacation adventure is always just minutes away. You can get anywhere quickly by car, but if you want to just sit back and relax, you can take advantage of the Pigeon Forge Fun Time Trolley. You can find stops throughout town to take you anywhere you want to go. Pigeons Forge’s most popular and the most visited theme park in Tennessee, Dollywood, is just the beginning. With countless go-cart tracks, arcades and miniature golf courses, Pigeon Forge is a ton of fun for the young and young at heart. For the thrill seekers, you can take a flying leap off a bungee tower, shoot into the air on a sling-shot, do some indoor skydiving at Flyaway or roll down a hill in a giant ball at Zorb. Enjoy a game of laser tag or cool off from the summer heat at Dolly's Splash Country. All of this excitement might rustle up quite an appetite. Pigeon Forge offers a wonderful selection of restaurants. From fine dining to fast food and everything in between, the dining in Pigeon Forge is second to none. And if you enjoy the great outdoors, you can discover golfing pleasure at one of the area's lovely courses, or take a stroll down to Patriot Park and enjoy a walk on the river. If shopping is what you're looking for, you have found paradise. Pigeon Forge offers four outlet malls and countless shopping centers for you to peruse. Offering everything from home décor and crafts to clothing and trinkets, you can find name brand items at outlet prices and one of a kind buys all over town. When the sun goes down in Pigeon Forge, it's time to pick up the pace. The city features nine major theaters and even more shows. You have easy access to numerous entertainment options for the entire family. All along the Parkway you can find shows filled with comedy, music, magic and action, giving you an overwhelming choice for your evening entertainment. So, with all that there is to see and do in Pigeon Forge, we're positive that you will have an unforgettable adventure. You will always find something new and unexpected in this little town in the Smokies. When you’re done with all there is to do in Pigeon Forge, don’t forget Gatlinburg is only a short drive away. The climate in Pigeon Forge is almost perfect. Summer is usually balmy with an average temperature of 84 degrees. Winter is moderately cold with an average temperature of 39.2 degrees. Pigeon Forge is in the Eastern Time Zone. In April we switch to daylight saving time. We revert back to Eastern Standard Time in October. Bed count: More than 10,000 hotel and motel rooms, cabins, chalets, cottages, and bed and breakfast inns. American Patriot Getaways offers 300 + luxury overnight rental cabins, chalets and condos for you to choose from. Pigeon Forge was a dry municipality but now you can purchase and consume beer and wine in local restaurants. You may purchase beer at several locations or wine at the Mountain Valley Winery. No retail liquor sales or liquor by the drink is available. You have to travel to Gatlinburg for liquor sales or liquor by the drink. Knoxville's McGhee-Tyson Airport is only 40 miles away and is served by eleven airlines with connecting services from cities including Memphis, Houston, New York/Newark, St. Louis and Philadelphia. The Gatlinburg/Pigeon Forge Airport, seven miles from Pigeon Forge and has complete airport facilities for small private aircrafts.